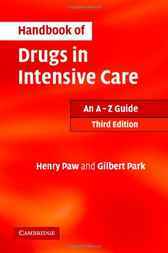 A thoroughly updated edition of this well-established guide to drugs and prescribing for intensive care. The book is split into two sections: an A-Z guide to the drugs available, and concise notes on the key topics and situations faced on a daily basis. The A-Z section provides succinct information on each drug including uses, limitations, administration directions and adverse effects. The second section details complications that may arise in patients with particular conditions such as diabetes, epilepsy and renal failure, and other factors that may affect drug prescribing. There is also a section of key data, showing weight conversions, body mass index and corresponding dosage calculations. This edition includes a colour fold-out chart showing drug compatibility for intravenous administration. Presented in a concise, compact format, this book is an invaluable resource for doctors, nurses and other medical professionals caring for critically ill patients.